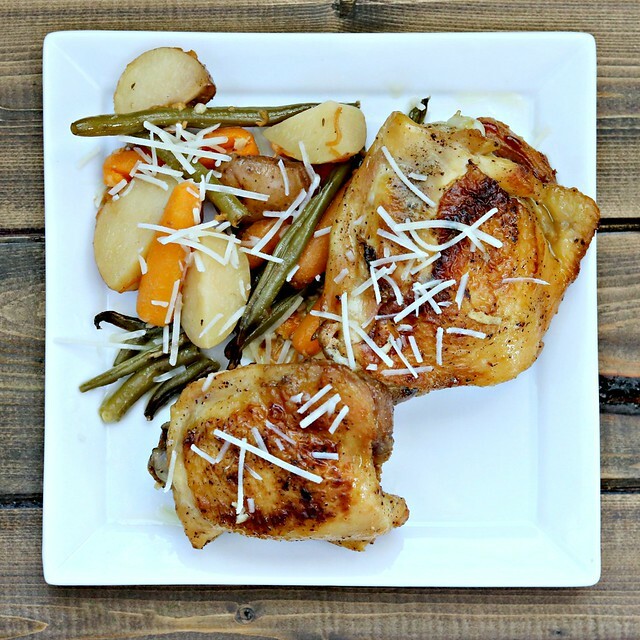 Slow Cooker Garlic Parmesan Chicken & Veggies is a weeknight dream meal. Browned chicken thighs with tender veggies, seasoned with garlic, Parmesan and herbs that you can throw in your slow cooker in the morning, and it’s ready to serve up when you get home in the evening! I’ve been making a concerted effort to make one slow cooker meal each week, because 1) it’s summer and the oven makes the house mighty warm, and 2) It’s nice to have little or nothing to do for dinner prep after getting home from work and picking up the baby. When literally every component of the meal is done in the slow cooker and all you have to do is serve it up, that is a perfect weeknight dinner, if you ask me. There is a little prep work ahead of time, with browning the chicken thighs, but if I have to put in 10 minutes of work in the morning to avoid 30 minutes at night, I am allllll over that. The tricky part for me is actually remembering that I have to do morning prep work and getting up a few minutes earlier. Because you know that the baby senses these things and wakes up early or is extra needy when mama needs to get things done. Because, of course. I love that I can just toss in my favorite veggies, mix them up with garlic, Parmesan, and some herbs and they are ready to cook. 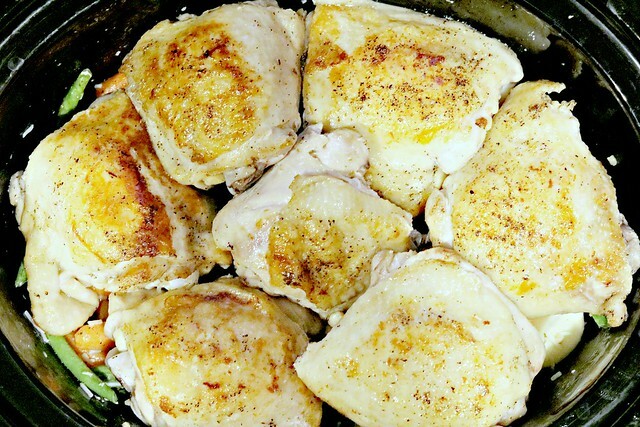 Then you brown the chicken thighs, and nestle them snuggly on top…cover with the lid, turn it on, and go about your day! Nat is quite the fan of cooked carrots and pretty much any meat, so this went over very well with her, and of course J and I loved it. I don’t cook skin-on chicken very often, but bone-in chicken (which usually comes with the skin on) is better for slow cooker meals when I am at work all day. Sure there is a timer, but if it only takes 2-3 hours to cook, do I really want it on warm for the other 6+ hours I’m gone? Notsomuch. So, I enjoy this variation to our usual boneless, skinless chicken breast meals. I think this is true of most slow cooker meals, but it never gets old. Then when you are ready to eat, you plate it up, top with some extra parm, and you’re good to go! Makes me think I should have slow cooker meals on the menu more than once a week, because it really is just so nice to have everything done and to have a little downtime to spend with the family before dinner. 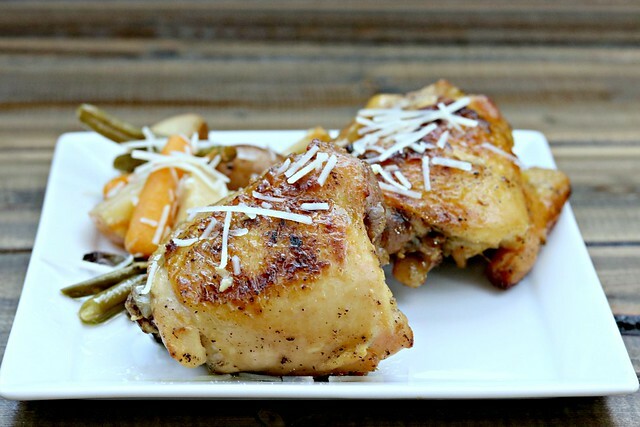 Slow Cooker Garlic Parmesan Chicken & Veggies is a weeknight dream meal. 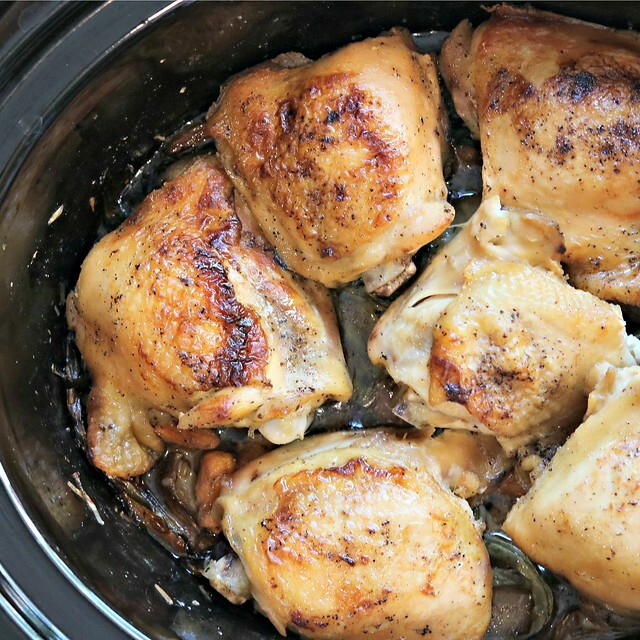 Browned chicken thighs with tender veggies, seasoned with garlic, Parmesan and herbs that you can throw in your slow cooker in the morning, and it's ready to serve up when you get home in the evening! In a large skillet, over medium high heat, add the butter and melt. Season chicken with salt and pepper, and place in the skillet with the melted butter. Cook each side for 1-2 minutes or until they have a nice sear and are nicely brown. 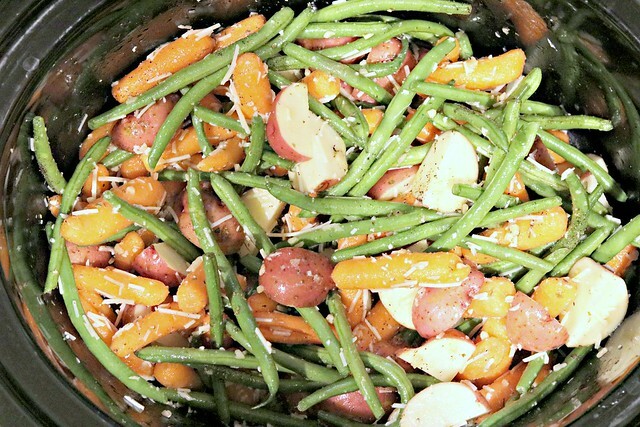 Add potatoes, carrots, green beans, garlic, Parmesan, parsley, thyme, and oregano to your slow cooker. Stir to mix well. Season with salt and pepper, drizzle with olive oil, and mix again to coat. Top the vegetables with the browned chicken and cover. Cook on low for 6 hours or high for 4, or until veggies are tender. Serve veggies and chicken topped with more Parmesan, if desired.